Basic card info – A thief sneaks off with 5 out of 7 swords. This is the “Thief” card. It implies that someone is stealing something from you, your honor, your ideas, your time. They may be spreading gossip about you. How to take control of this situation? You have to be equally sneaky. Sometimes, to win a race or battle, the Charioteer must direct his horses around instead of straight on. You may feel like you want to go charging in, be confrontational, but this is not going to work. That is the out-of-control solution which will allow the thief to play the innocent. 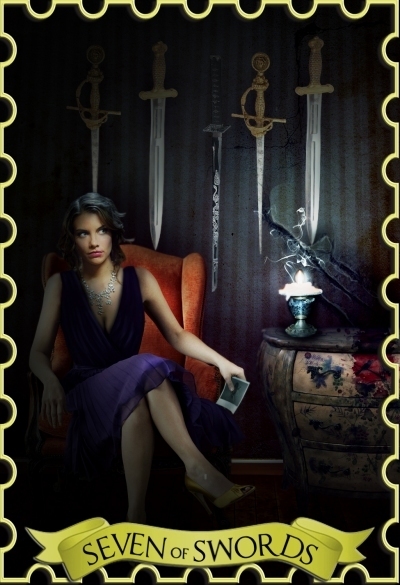 To catch a thief, you must be a thief. .
My notes – Bella already has the first five swords but is still missing the final two of wich she holds a picture of in her hand and thinking of how to get the other two swords.